Footwear brands have been vigorously experimenting with sneaker colorways, attempting to find a good balance between interesting aesthetic and high-end functionality. Of recent, labels have been looking for inspiration from the culinary industry. Thus, numerous dishes have informed sneaker colorways — from wasabi palettes to caviar and vodka combinations. 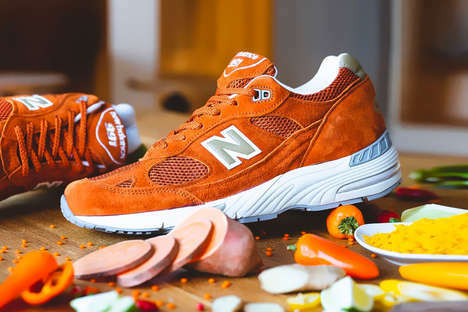 The latest food-inspired silhouette is by New Balance and it is a rendition of the brand’s iconic M991 model. The upper boasts burnt orange, with the branding in grey. The piece is said to take design cues from food and aside from the attention-captivating sneaker colorway, the M991 also boasts a high-performance construction which includes ABZORB cushioning for premium comfort during activity. The pair retails for $180 USD.